1 Mercury glass footed vase 7.5 inches H, 3.25 inches Diam. 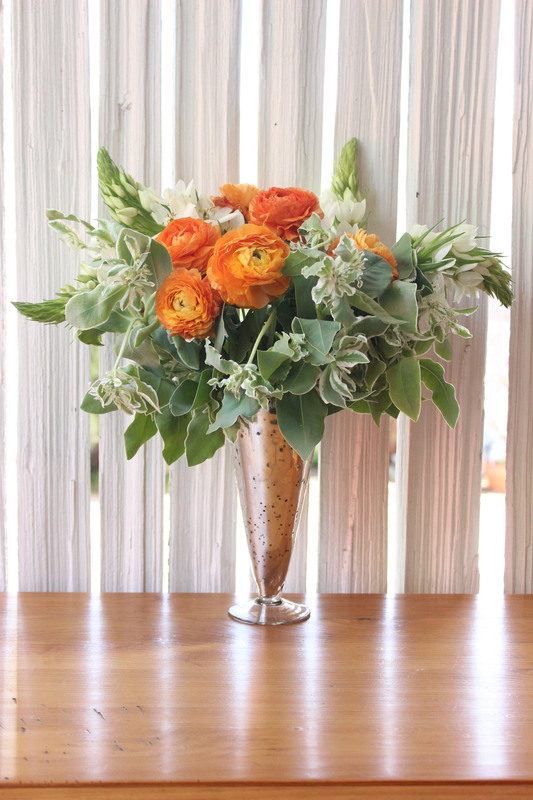 This arrangement is perfect for a centerpiece. It's low and not too big. The mercury glass dresses it up a little bit. The white and green 'snow on the mountain' is very delicate. The leaves drape softly and look almost like velvet. The 'star of Bethlehem' has spears loaded with small white flowers, and the arrangement is punctuated by the orange and yellow of the ranunculus. You can buy all of these flowers in the spring. By the way, the 'snow on the mountain' moves around when you are arranging it and falls where it may. You need to be careful as you work with it, as the stems snap easily. You can go antique hunting for your mercury glass, or you can find reproduction mercury glass, or you can make a type of silvered glass. Antique mercury glass was made with double layers and then a solution of silver nitrate and grape sugars was put between the layers. Today, you can make mercury glass or silvered glass with a piece of glass, looking glass spray paint, rubbing alcohol, a spray bottle of water, and paper towels. Well, now that we've talked about 'snow on the mountain', 'star of Bethlehem' and mercury glass, are you ready to go? Let's start. Fill with water until it's 1 1/2" from the top. Cut your 'snow on the mountain' to about 14 inches. Cut your 'star of Bethlehem' to about 14 inches. Add 'snow on the mountain' to your vase. Add 'star of Bethlehem' to your 'snow on the mountain'. 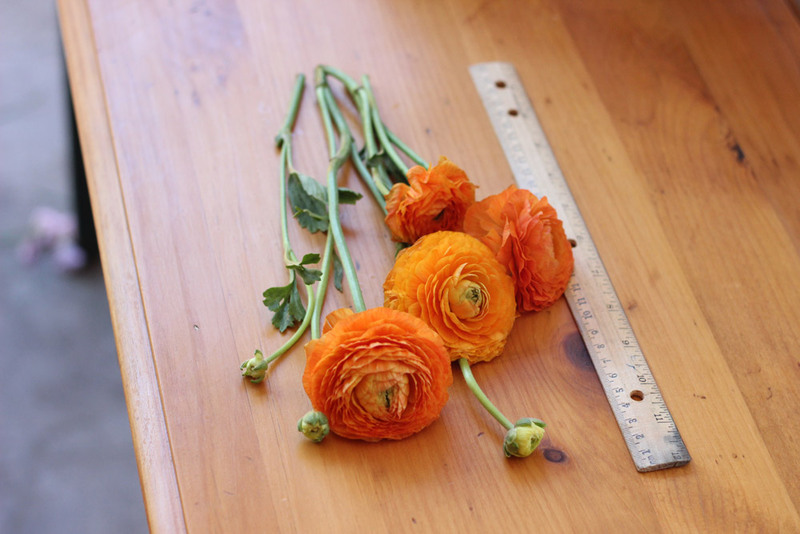 Cut orange ranunculus between 5.5 - 10.5 inches. Cut 7 - 8 ranunculus between 5.5 and 9.9 inches. Add yellow ranunculus and you are 'fini'. Ooh la la.